Stray pets can often be a big problem, but this highly proven design provides a reliable solution. Your cat wears a small magnet that doubles as an identification tag. 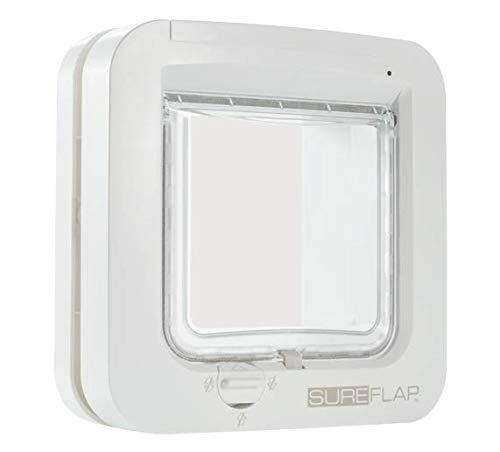 A sensitive, fast-reacting circuit in the cat flap guarantees instant entry for selected cats of all size and temperament. An easy to use 4 Way locking system enables complete control over your cats movements. Any animal can exit the door, but the animal requires the magnet to re-enter. Self lining to 2 3/8 (60mm) - ideal for all doors. One 9 volt battery not included".Helpful tips:1) The collar magnet should be attached directly to the cat’s collar with the paw print symbol facing forwards (see fig 4 of the User Manual). Not doing so will affect this product’s Performance.2) Ensure that the four way lock is fully seated in the correct position, i.e. 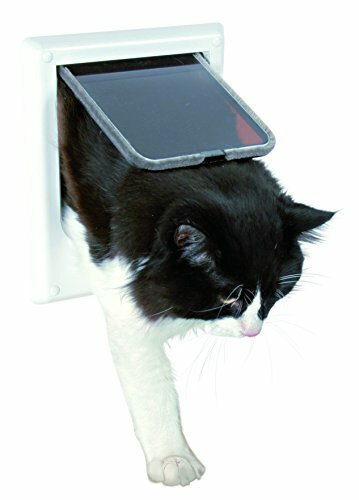 in order for pets to go in and out it should be in the unlocked position. 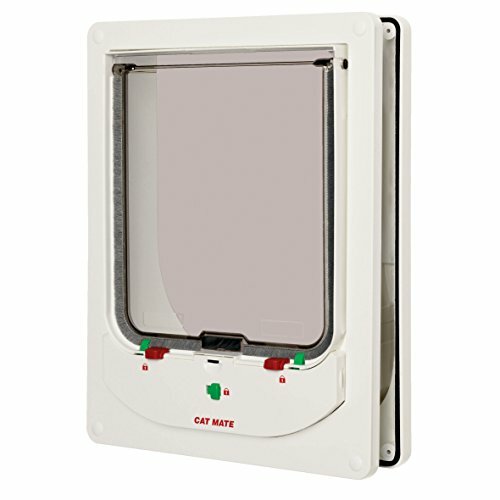 Provide your pets with safe and secure home entry with Trixie's Electromagnetic 4-Way Locking Cat Door. Your cat wears a small collar magnet (item 3871) that doubles as an identification tag. The innovative circuit in the cat flap unlocks the quiet running door for entry or exit as your pet nears. The durable plastic frame and flap with special sealing and magnetic closure and 4-way security lock are perfect for any door in the house. Includes a tunnel element to extend the depth from 0.25 to 1.25 Inch. Suitable for cats up to 15 pounds. Battery operated (9 V battery not included). Quick and easy assembly. All hardware included. Three year warranty. Color: white. Dimensions (Inch): outside frame 8.25 x 9.5; rough cut out 6.5 x 8.5; flap 5.75 x 6.25. Weight: 1 pound. Size available and cat applies to: >Large: Outer size: 9.25"(W) x 9.84"(H) x 2.17"(D) Inner size: 7.08"(W) x 7.48"(H) x 2.17"(D), it's suitable for cat lighter than 17.64 lb and waist circumference shorter than 23.62". >Medium: Outer size: 7.56"(W) x 7.87"(H) x 2.17"(D) Inner size: 6.18"(W) x 6.30"(H) x 2.17"(D), it's suitable for cat lighter than 15.43 lb and waist circumference shorter than 15.75". >Small: Outer size: 7.56"(W) x 7.87"(H) x 0.71"(D) Inner size: 6.18"(W) x 6.30"(H) x 0.71"(D), it's suitable for cat lighter than 13.22 lb and waist circumference shorter than 11.81". Note: 1). Due to manual measurement error, 1~2mm difference in size is normal, thanks. 2). Make sure that the width and height(shoulder level) of the pet are inferior to the pet screen door, thanks. The PetSafe SmartDoor allows you to control your pet's access. When the SmartDoor is set to Automatic mode, only your pets wearing the SmartKey can pass through the SmartDoor. As your pet enters the range of the SmartDoor, the SmartDoor detects the SmartKey and unlocks automatically. The range is adjustable up to 3 feet. After your pet passes through the SmartDoor, the door will lock automatically helping to keep the house pets in and outdoor animals out. Included in the Box SmartDoor Pet Door with Flap SmartKey (shipped in the battery compartment) Battery (PetSafe RFA-67) Mounting Screws (shipped in the battery compartment) Key Ring Cutting Template (folded sheet in the Installation Guide) Installation Guide Product Dimensions Door Size Flap Opening Suggested Weight Small 5.5 in. x 7.875 in. Up to 15 lb. Large 11 in. x 16 in. Up to 100 lb. 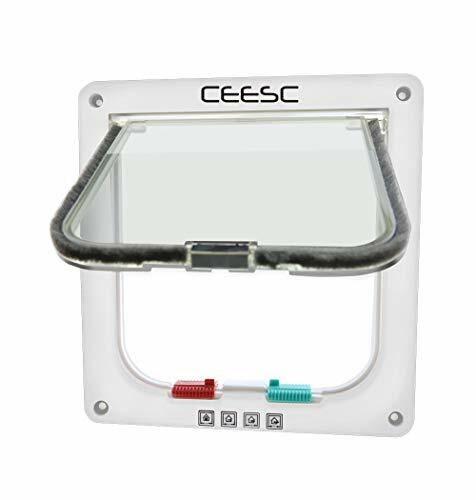 Frequently Asked Questions Q: What door thickness is this pet door compatible with? 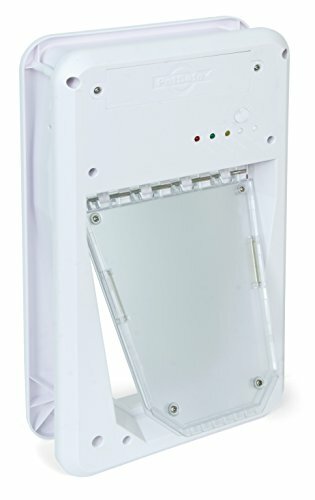 A: The PetSafe SmartDoor Pet Door fits standard doors 1.5 in. - 2 in. thick. 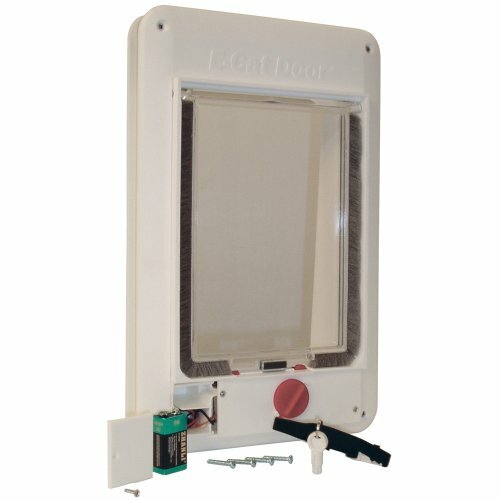 Q: Can I install the PetSafe SmartDoor into a wall? A: You can install the PetSafe SmartDoor into a wall with the PetSafe SmartDoor Wall Conversion Kit (sold separately). 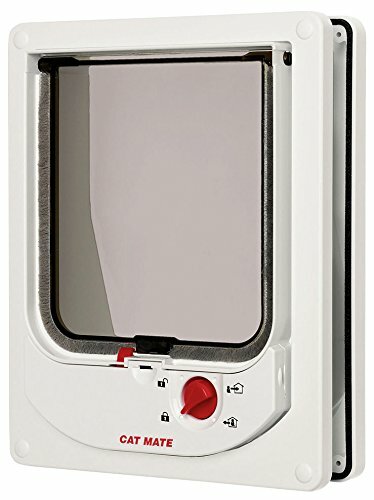 ELECTROMAGNETIC CAT FLAP White Silent Safe Automatic Cat Door NEW! 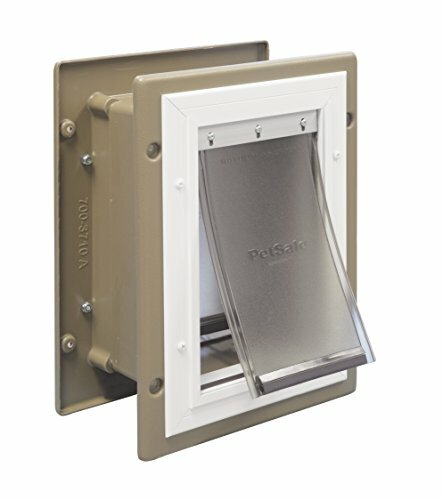 Want more Electromagnetic Cat Door similar ideas? Try to explore these searches: Recycled Mechanical Pencils, Custom Usb Thumbdrives, and Awareness Pin.